I was stuck — elbows deep in fabric with nothing but a torn pattern book and lingering words of cryptic quilting wisdom from my late great-aunt. It was T-minus two hours until the baby shower and I was on the verge of showing up empty-handed. My rescuer was Jenny Doan of Hamilton, Missouri (pop. 1,809). Her quilt shop is a mere 1,200 miles from Upstate New York, where I sat that day with my laptop, being walked step-by-step through finishing my first quilt. In 2008, Jenny’s kids bought her a quilting machine and showed her how to blog. Missouri Star Quilt Company was born. At first, the shop wasn’t much different from the quilt shops you find in any small town, including the cute little shop five miles from me. Today, Missouri Star Quilt Company has over 120,000 subscribers to Jenny’s online quilting tutorials. That’s everyone in her town … times 67. Subscribers, thousands every day, thank her by buying fabric from her online shop. For me. For Jenny. But not for Judy. Judy owns that cute shop in Upstate New York. Judy is smart, has a great selection, and has an amazing eye for quilting. I asked her one day about putting her newsletter online. She replied that most of her customers don’t have computers. The customers with computers, like me, are driving past her shop on their way home, where they order the same fabric from Jenny — 1,200 miles away. As the First Prize winner, Abbey received a lifetime membership to Authority. Previously, Grand Prize winner Anthony Sills received a ticket to Authority Intensive, the content marketing experience we are hosting this May. You can read Anthony’s winning essay here. And if you want more insight on how we whittled 270+ essays down to five winners, watch the Essay Contest Wrap-Up Hangout with Demian and Jerod. They highlight the specific elements of the winning essays that separated them from the pack. Abbey Dieteman has been a direct response copywriter since 7th grade when she wrote a 30-page sales letter asking her crush to the dance. Since then, she's converted better... writing sales pages and emails you've probably read from some of the biggest names online. She's also a chainsaw instructor and mom to 2 awesome kiddos in Upstate NY. You can find her at onlifeandwriting.com. 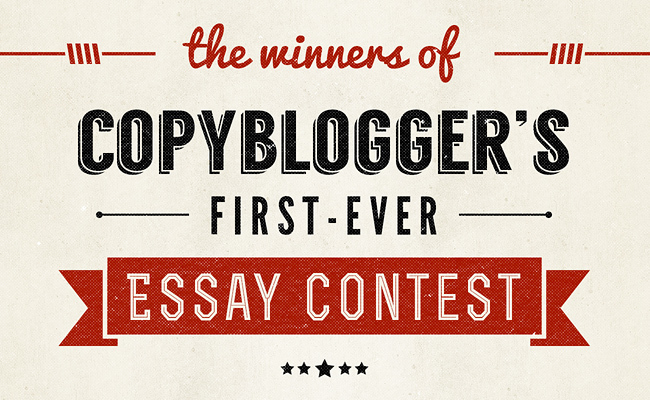 Next article: Follow @copyblogger on Twitter! Thanks, Rick! Nice to hear from a fellow Upstater! Great entry. Succinct, and to the point. Thanks, John. 250 words is way tougher than 1,000 words! Thanks, Sri! Stories are so effective — I like to use them because they are more fun to write! Perfect example of the power of content marketing and how it works even for the smallest of businesses. Also great example of how you can get the big idea across in fewer words but not lose any of the impact. It’s funny, the first few drafts of this we so much longer, it was a great exercise to show how much content you can strip away and still be left with the meat of the piece. I think you captured one of the most overlooked aspects of doing business online with your “small town, big audience” angle. It doesn’t matter if you don’t have an audience locally since you’ll be sought out by people everywhere who can benefit from your expertise as long as you make yourself available. With more than 2 billion people using the internet worldwide, you and Jenny are on the right track. Maybe you should show Judy your winning essay and suggest she reconsider putting her newsletter online. I loved your quilting story too, BTW. Congratulations! Thanks, Anthony! It was so great to see how vastly different approaches we took. I’m looking forward to the other essays, too! It’s so true — in today’s world, the vast majority of businesses don’t have to limit themselves to their local market anymore. They miss a huge opportunity. I love this story because its not a high-tech business or a business that one would automatically think about putting online. Jenny and team have done an amazing job, which is why they are so successful. You can’t follow the same path as everyone else and still get extraordinary results! Great essay, Abbey! Short, to the point and interesting. A perfect example of the power of the internet and blogging! Love that this won. Great example of how to write a short yet impactful blog post, and great example of the value of blogging for your business – no matter how old/out of touch you think your target audience is. Absolutely! Judy’s idea of who her customers are has been very limited. There’s a whole group of people that WANT to be her customer. I love Judy and her shop, but I spend many an evening browsing MSQ. Could I get in the car and get the same stuff? Probably. Excellent post Abbey! I’m a Copyblogger employee and also a quilter. I also follow Missouri Star Quilt Company online and I’m in Canada! My local quilt shop? They think they’re “too small” for such a big presence or that the bulk of their customers are not online. :-/ And it’s also “too much work”. Imagine if Jenny had thought the same. Awesome Andrea!! MSQ tutorials are incredible. I think about my local shop all the time. Jenny’s shop was so small and in such a “small market.” So cool to see how they grew! I think this one resonates with us all. And delivered so flawlessly. Congratulations on your win. You deserve it in spades. Only one thing…can I see a picture of that quilt? You’ve got me curious to know more. Not a bad thing, right? Hey Lori! Thanks so much for such a kind comment! Here’s a few quilts (by no means all of them) but the one labeled “first quilt” is the one I reference in the article! Ah, get along li’l doggie! I’m sure it’s worn bare around the edges with lots of loving by now. Thanks for satisfying my curiosity. This gives hope to prospective small business owners who are looking to make an impact further than their hometown. And it’s also very inspiring for new bloggers like me. Thank you. This must have been a close second place…I like the journalistic feel to your essay. Extremely practical yet motivating read. Beautiful! I’d love to see more short essays like this. Interesting and to the point, with a great lesson. Whew! What a crisp and powerful ending! Great post and wonderful story. Here’s to the (not so) little guy. Thanks for sharing. This one is really inspiring and interesting.it will be reach audience very fast.Congratulation Abby.